Even though Zahra may be a local Philadelphia designer, I am quite positive you heard her name, or you will in the near future. Like Liz Claiborne, she too is a designer and a business woman. She believes that is what makes her stand out, and I think she is right. On March 11,2009 she opened her first 1,800-square-foot clothing store at 1905 Walnut St selling only her merchandise. 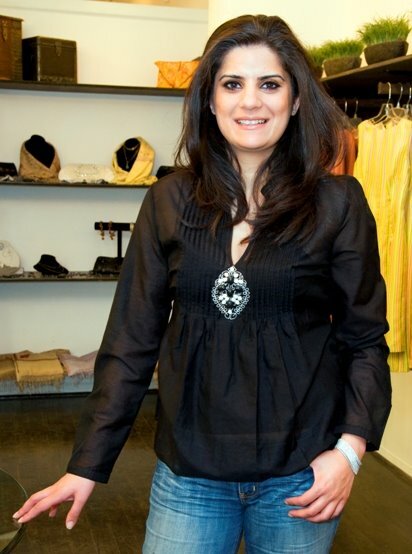 Her designs fuse Pakistan and American cultures to make an irresistible and well developed line. How irresistible, you ask? Well so much so that her first line EVER ( Fall 2009) was featured in Glamour Magazine, picked up by 26 boutiques in areas like London, Paris, and NYC, and her clothing is available in show rooms in LA and London. Zahra is making her way through the fashion world on a different path than most up and coming designers. While others wait for deals from department stores and Boutiques, Zahra opened a boutique of her own. That is a huge investment. She got the start up money the old fashioned way, she saved. While the final price tag on her investment is unknown, she does disclose that it is in the hundreds of thousands of dollars. Recently, she has secured a loan from the bank in order to open two more boutiques, one in MD and another in Connecticut or Washington. Her journey to becoming a designer and entrepreneur is also one for the books. She was the daughter of a wealthy Pakistani landowner and she was treated like a princess, she even had tailors that custom made the family’s clothing. After her arranged marriage she moved to Canada to play the role of housewife. After having two kids and pretty mundane life, she and her husband split. She tried to find a job with no moral support from her family. She landed a job as a loan officer and after only two months she secured her first mortgage and was promoted to Executive Vice President. In 2007 she began researching fashion and from there things began to move full force ahead. With no formal training she did a few sketches of her vision. She then found a pattern maker and sample makers on craigslist, bought a studio in PA and quit her job in April of 2007. The industry was brutal to this new designer, she was rejected at every show room in NYC. But she did not give up. Which brings us to where she is today, in a fabulous Rittenhouse Square, Philadelphia show room with a $6,000 chandelier hanging from the ceiling, ottomans all around, and clothing lining the walls that is affordable and diverse in its fabric and design. Even if you were not able to make it to her store in Philly , not to worry, she has a shop online website up and running ( yes already) that is ready to take your order nation wide. Her clothing is unique and I am sure that I can find nothing else like it even if I tried. In every piece I can see a little bit of her heart and soul. Not to mention she traveled around the world to Paris, London and Pakistan to find her fabrics. This Moorsetown resident is on an express Acela train straight to the top and I won’t be surprised if she is in the 2010 Bryant Park Fashion week Canoodling with Celebrities and Top Designers. 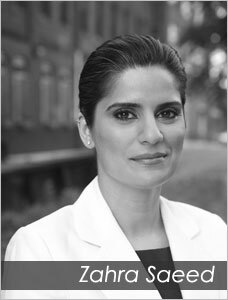 Check out her store and website: 1905 Walnut Street, (877) 204-1131, www.zahrasaeed.com. Also look at her look book here. I guarantee you are going to fall in love with the Fall 2009 line. I promise. As a matter of fact, Zahra, can I please do a pre-order on that cream coat my goodness. Below I going to post some of her pieces that I think are TDF ( to die for). If you don’t already love her, you are about to.